Where is the WRQoL scale being used? Researchers from all around the world use the WRQoL scale. 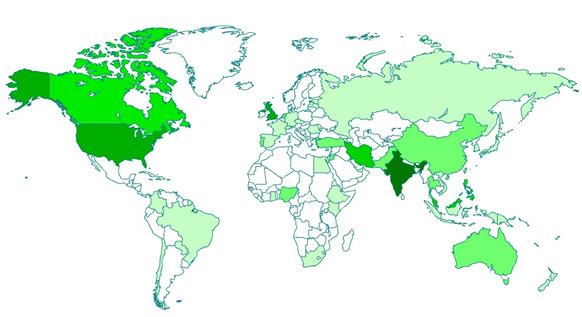 The map below indicates which countries researchers have requested to use the scale. The darker the colour the more researchers have requested the scale. 500 Researchers from over 45 countries have used the scale, with translations existing for a number of dialects and languages including: Chinese, Farsi, French, Portuguese, Spanish, Turkish and Welsh. Please contact us if you would like to use an existing translation of the WRQoL scale or need advice on how to translate one for a different language. If you would like to know more, then please contact us through our enquiry form.